I was lost in thought, my hands occupied with gathering the wood I'd just cut for kindling at the top of the drive. The sun was warm, the earth smelled of spring on a January day, altogether a very peaceful and satisfying time on a country afternoon. And I happened to glance down toward the pasture and found that the dog, too, was lost in revery, even as he surveyed the pasture along Nameless Creek for marauding ground hogs, squirrels or the odd mid-day deer. I ran inside for the camera, and walked back out nonchalantly, knowing that if Tsuga had any idea he was my intended subject, he would immediately be at my feet, wagging his tail, thinking I wanted to be close. No, my lens focal length is not that short, fella. Go back and sit down facing south, and look casual. I did have to reposition him (which amazingly he allowed) although I didn't capture fully the wistfulness and tranquility I first saw, with him sitting there, on guard, in command, and fully at rest and lost in his puppy-thoughts. I've seen the same view, Fred, with our dog. You took a great one. Our English Springer sits in our backyard surveying "her" hill and surroundings. It's always been a neat scene, but she'd never allow me to actually take it without coming over thinking I'm ready to throw a rock to her. 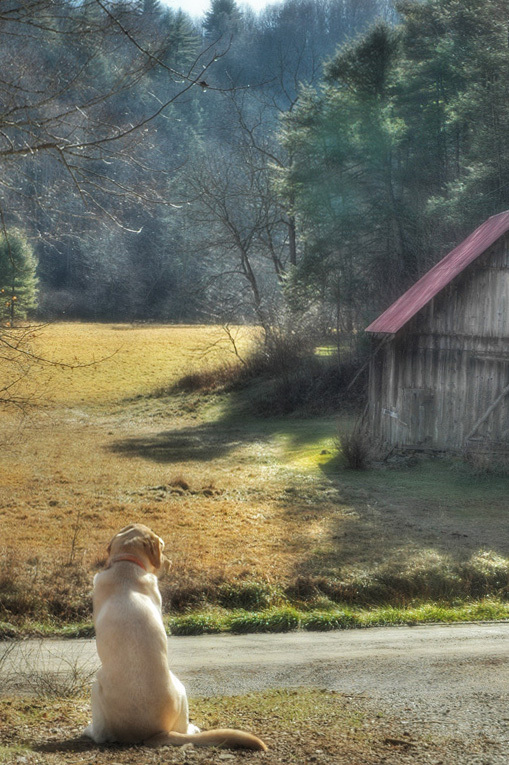 And...there wouldn't be a famous barn in my picture! LOL! Your photographs are so expressive, the colors so rich. Thank you for sharing your talent and view with us. I LOVE THE PHOTOGRAPH. THIS PHOTO IS NOW ON MY COMPUTER SCREEN, AS BACKGROUND. WHAT A DOG, THAT TSUGA. Good dog, Tsuga. Great photographer, Fred.